Delia Ephron has written books for adults and children, worked as a screenwriter, and contributed articles to New York magazine, The New York Times, Esquire, and Vogue. Hanging Up showcases her finely-tuned ear for contemporary dialog and her ability to catch both the heart and heartache of family relationships. At 44, Eve Mozell has a wonderful husband and a creative job. She also has a temperamental teenage son, two headstrong sisters, and a demented old father. As she deals with her family's frequent crises, her days overflow with lengthy phone calls. She is never far from a dial tone. But as her father begins to die, Eve is tempted to disconnect and to sort out her feelings for this difficult man. 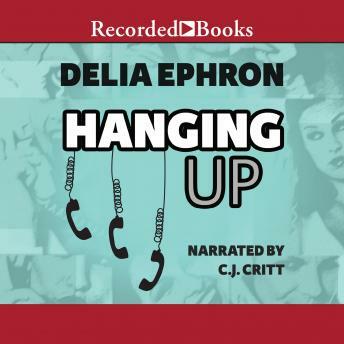 Delia Ephron's balance between warm humor and sharp wit are irresistible, and narrator C.J. Critt's performance adds extra energy to the affairs of Eve and her family. In Eve's conversations and relationships, Ephron creates marvelously accurate reflections of modern life and love.